"The cattle didn't have anywhere else to go... We've got a railway line close to us and the whole railway line is just tangled with dead cattle," Anderson told French Press Agency (AFP). 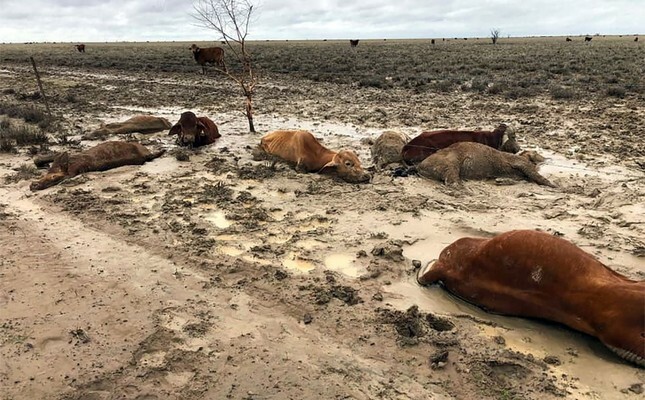 About half of Australia's 25-million strong cattle herd is bred in Queensland state, and graziers say the floods — described as a once-a-century event — could devastate their industry. A spokesman for global commodities trader Glencore said on Friday there was "short term" production disruption at its Collinsville and Newlands coal operations because of heavy rain. "Queensland desperately needed rain and now it's had way too much in some areas," said Phin Ziebell, agribusiness analyst at National Australia Bank. "I just don't think we have enough information at this stage to determine the scale of the stock losses and what benefit that part of the country can get from a bit of pasture," he added.